I recently visited San Juan and several other nearby areas as part of a project between Conde Nast Traveler and the office of Tourism of Puerto Rico. I documented some of my experiences here and this entry is the continuation of the first one. As part of my trip, I embarked on the adventure to go to Naguabo, a forestall area on the east side of the island, where artist Juni Figueroa, a Puerto Rican who this year participated in the Whitney Biennial, built a tropical installation. After arriving at our destination, Juni himself guided us through a secretive path filled with tall trees and dense vegetation. We then found a 20 feet high structure that Juni erected using materials found on the streets of San Juan and painted the same colors as the indigenous plants around the structure. We climbed up to the top and spent some time in close contact with nature. Thereafter we drove in the direction of the beach, also in Naguabo, to visit the stunning private residence of Puerto Rico's art collectors Cesar and Mima Reyes who graciously hosted our lunch overlooking the Caribbean Sea. The house was designed as a collaboration between Cesar, Mima and contemporary artist Jorge Pardo and it is, by and in itself, a piece of art. The mid-century modern furniture adds simplicity to the technicolor structure of blues, yellows and reds while the strength of the contemporary art on the walls provides depth and sparks even more conversation to an already sensorially-loaded experience. Among my favorite pieces of the collection were the hanging buoys by Abraham Cruz Villegas and the large canvas by Jose Luis Vargas. 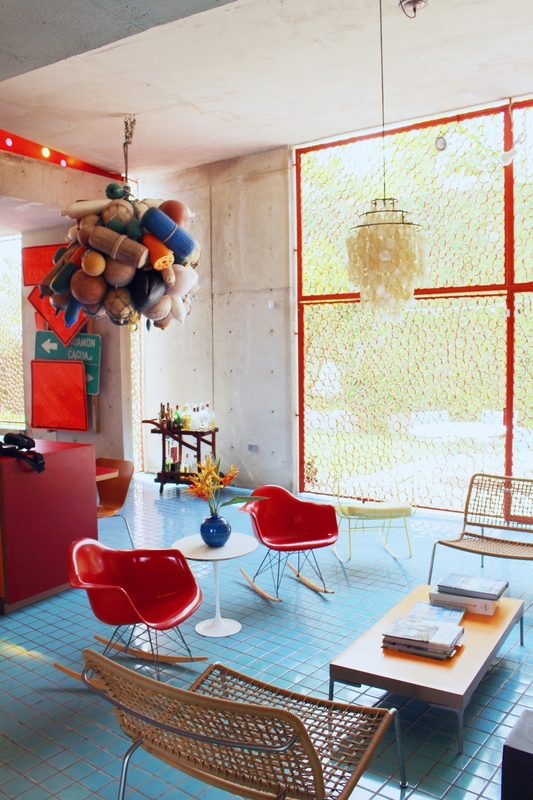 We also went to see Victor Monserrate, a young artist and industrial designer whose airy and bright workspace is in the suburb of Guaynabo, has studied and lived in London and New York and worked in São Paulo, Shanghai and Beijing. His furniture pieces are ingenious combinations of unique materials like wicker and steel, carbon fiber and medical cast. He also created a gooey set of cups made with a compound he invented, using local ground coffee as raw material to attain both consistency and color. Overall, Puerto Rico is poised to become a global arts destination. San Juan is filled with vibrant artists, museums, galleries and collectors who are committed, excited and bringing the right energy to this emerging multicultural art scene. I can't wait to go back and see more.